How does one have something (say a figure) span multiple columns when using the beamer columns environment? 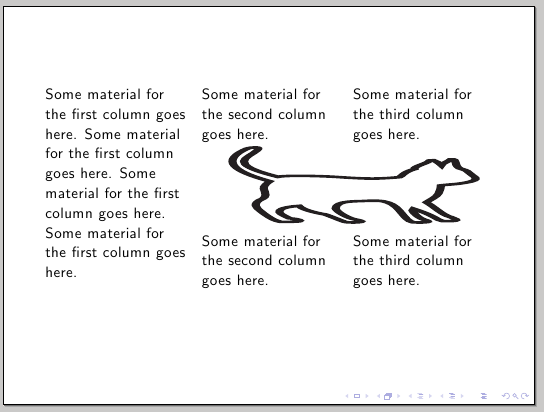 Nathaniel Johnston's beamer poster template does this by nesting two columns environments, but this fails for me--somehow the column widths get messed up and things run off the page. And here's the code showing one possible approach to have an image spanning two out of three columns. 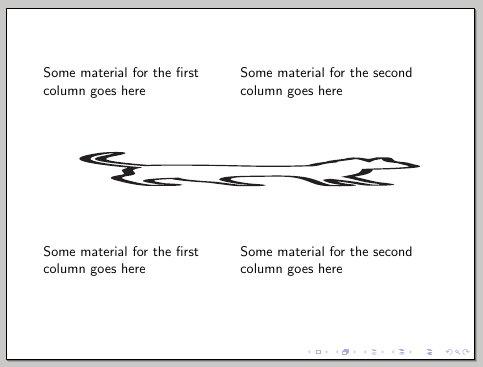 The idea is to have one outer columns environment of width, for example, \textwidth; inside this environment two columns are created; one of them twice as wide as the other one; inside the wider column, the idea from the previous example is used: an inner columns environment is used to produce two columns of equal width; this inner columns environment is then ended to include the image spanning two columns, and finally another inner columns environment is used to hold the final two columns. Some material for the first column goes here. Some material for the first column goes here. Some material for the second column goes here. Some material for the third column goes here. Not the answer you're looking for? Browse other questions tagged beamer columns beamerposter or ask your own question. How to line up blocks in columns with full width blocks in beamer/beamerposter? Forcing beamer blocks to be the same height — interaction with figures?